The piD-TECH plus® Plug-in Photoionization Sensor provides complete photoionization detection capability and can be installed in portable and stationary gas monitors that accept the City Technology™ - 4P cell dimensional profile. This gives gas monitors a new and powerful detection capability that was previously unavailable. It can be utilized for an incredible variety of environmental and safety applications in industrial, commercial, and residential markets. 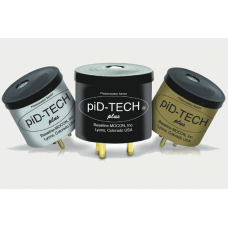 The intrinsically safe piD-TECH plus® can easily be integrated into gas analyzing and monitoring instruments greatly reducing new product development costs. The sample gas is exposed to an ultraviolet light from a UV lamp. The light ionizes the sample that is then detected by the instrument and reported as a concentration. Chemicals such as Volatile Organic Compounds (VOCs) with an ionization potential less than the eV of the lamp will be detected by photoionization. Contact Baseline® for a comprehensive ionization potential list.